Brouwerij de Molen is a small Dutch brewery that produces a spectacular array of beers – their website lists nearly 60 different brews, although it concedes that “some are retired and some aren’t mentioned yet”. That list is actually quite interesting, because I’ve only ever come across bottles with the very distinctive, plain black and white labels such as the beer pictured below and they’ve invariably been big, alcohol-heavy monsters. Whether this is because those are the only ones that get exported to the UK, I’m not sure. This is Heen & Weer, which translates as “Back & Forth” – a reference to the fact that with their brewery at one end of town and their warehousing at the other, the beer has quite a long journey before it even reaches the bottle. It’s a rich orange-gold coloured Triple, at a respectable 9.2% ABV (although the website lists it at a slightly stronger 9.5%), with a nice, deep and billowing, fine textured head. The nose is surprisingly muted; orange peel and caramel, spicy yeast and a hint of wet coriander, a touch of malt underneath but very little alcohol. The taste starts with lots of lovely champagne foam in the mouth, honey sweet with a fleeting peach fruit flavour. That’s all then quickly washed away with a serious alcohol heat, sweeping in with a nicely yeasty spice. After that, some big resinous hops come along to balance out the sticky sweetness and alcohol and throughout it all there’s an almost perfumed floral undercurrent. It’s rich, complex and intriguing but although it’s certainly a monster beer in the mouth, the nose lets it down a little. 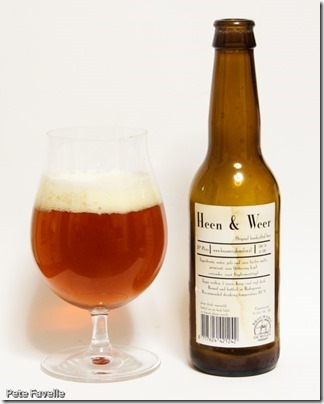 Still a great beer, but I know that Brouwerij de Molen can do better. 4 stars.